On February 24, 2018, a large crowd of Mixed Marital Arts fans and curious spectators will be gathering in Nisqually to watch the inaugural promotion from local business duo, Frank and Haley Wellman. 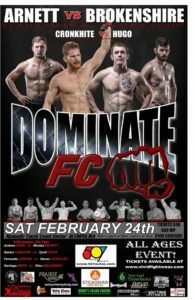 Fighting out of Eatonville and training in Yelm with Brad Pole at Elevate Martial Arts Center, Eric Cronkhite is a striker with a 4-3 win/loss record in MMA. 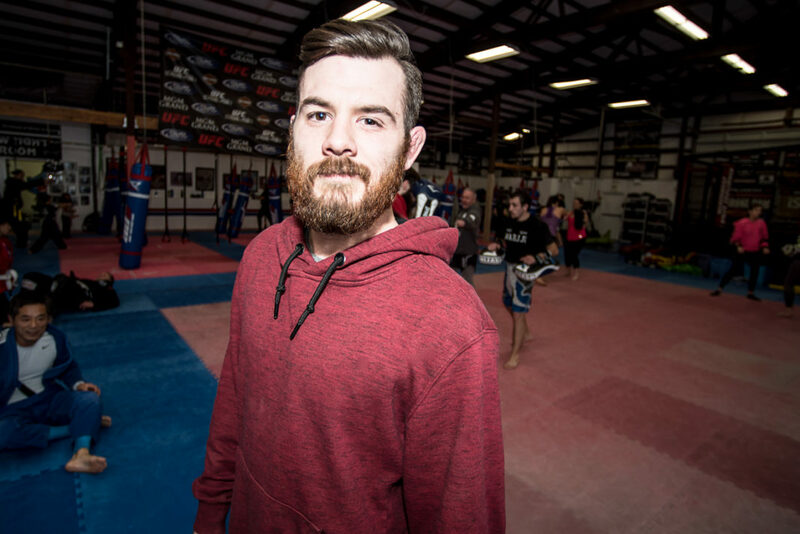 His amateur record was 11-6, so this 23-year-old has some experience under his belt. His plan is to change that belt to a Dominate FC Championship one. Pole, a Navy veteran who has been training fighters since 2004, is confident but focused on the work they still have in the coming weeks. “This is the longest notice we’ve ever had for any of Eric’s fights. They (fight offers) are normally very short notice. I think we still have a lot of work to do. This is Eric’s first time going down to 135 pounds, so on that end there is some work to do, but we are on the right track,” Pole explained. If anyone knows what it takes to prepare for a fight, it is Johnson. With 200-300 fighters trained to fight professionally or participate on the amateur side during his 17 years teaching on College Street in Lacey, Johnson is passionately confident in his fighter. With so much dedication and motivation it is a shame someone has to lose. Hugo is trying to make MMA a full-time job to fully support his wife. Cronkhite, who suffered from bullying as a kid, wants to show current sufferers that someone out there cares about them. He says that wrestling saved his life. 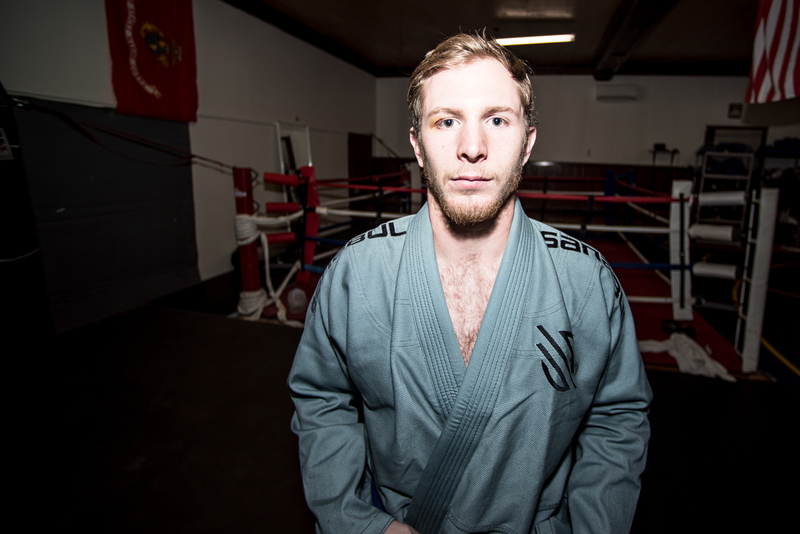 Eric Cronkhite fights out of Brad Pole’s gym Elevate Martial Arts Center in Yelm. Such is the world of MMA: two young men, confident in their skills, ready to put their blood, sweat and tears into less than a half hour in a cage to prove themselves and make it to the next level. This style of matchup is interesting not only to fight fans but the promoter as well. “Eric is a powerhouse with his knockouts and Justin has sneaky submissions,” said Frank Wellman. 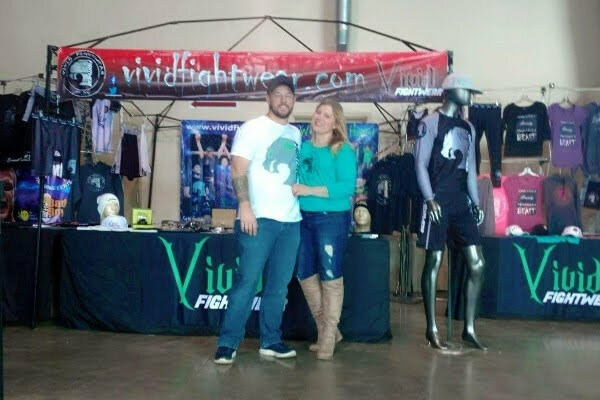 Wellman, co-owner of Vivid Fightwear with his wife Haley, is focused on providing a safe night of fights that brings entertainment and business dollars to Thurston County. He is doing that by making smart match-ups that make sense, selecting fighters early, being transparent with local gyms wanting a spot on the card and paying the fighters fairly. Part of that support comes from keeping the sponsorships local. The major business sponsorships include 507 Motorsports in Roy, Steadman Properties based in Lacey, Mr. Doug’s Restaurant in Yelm and Prairie Hotel also in Yelm. The other secret to Dominate FC’s success is Frank’s wife. The areas that include details and “flair,” as he puts it, are covered expertly by Haley Wellman, who has run a photography studio, graphic and sign shop and a custom embroidery and apparel shop. Win, lose or draw, in the end these local fighters and coaches who all know each other will still be friends. Their respect and admiration for one another was clear even while pumping themselves up for the event. They will remain buddies in the end, but on February 24, 2018, the gloves go on, and they will see who gets to wear that shiny new championship belt. The fighters will weigh in at 6:00 p.m. Friday, February 23 at Red Wind Casino’s Coho Sports Pub. The public is invited to come watch the fighters as they see each other for the first time, pre-fight. This event is free and open to the public. 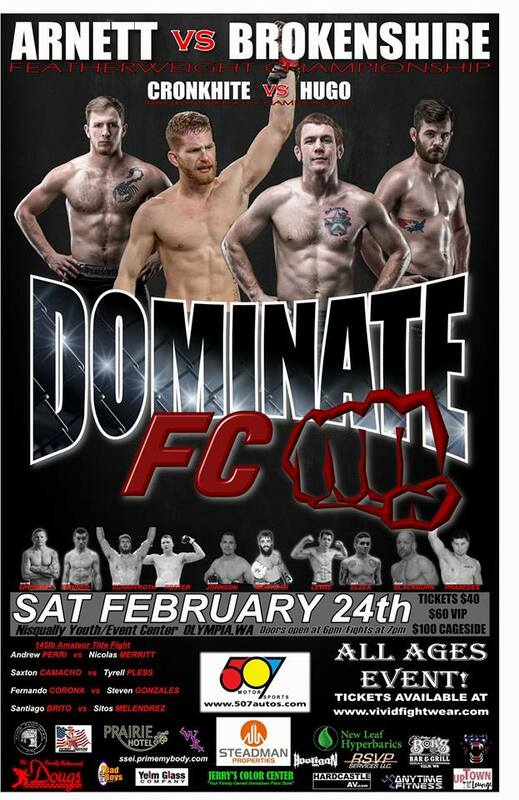 Dominate FC is taking place at the Nisqually Youth Center on February 24. Doors open at 6:00 p.m., and the action starts at 7:00 p.m. With an energetic crowd expected, a sell-out is possible, so get your tickets soon. $40.00 is the cost for general admission, $60.00 for VIP and $100.00 if you want to sit ringside and really feel the action. Tickets are available at www.vividfightwear.com.